San Andreas Will Have You Shaking For All The Wrong Reasons! 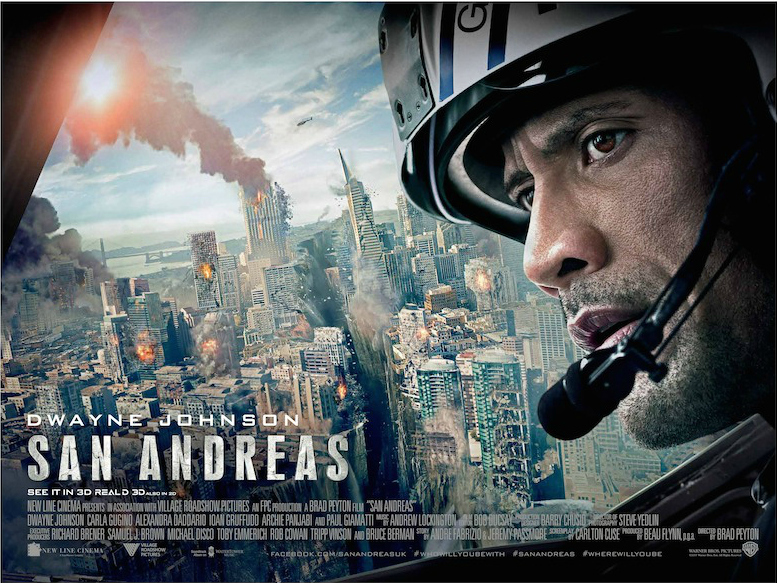 I can see the appeal of a movie like San Andreas. It has a likable lead and you are guaranteed a lot of action, I mean that is why I saw it, but you should stay far away from this flick. Well, unless you are having a bad movie night, then it might be the right choice. Its script is so bad it must have been written during the writer’s strike and they just forgot to update it. If you came for Dwayne ‘The Rock’ Johnson flying around in his helicopter while things fall apart, you will be happy for about half of this movie. Watching LA and San Francisco get demolished is kind of cool looking. So there is some enjoyment to be had as he flies all over California saving his family, but those moments are quickly squashed every time someone opens their mouth. I mean the dialog in this movie is SyFy Original bad. Except for the fact with movies like Sharknado at least the writers are in on the joke. I am not sure what happened with San Andreas script. I looked up the guy who wrote the screenplay on Wikipedia and I was shocked to see how much good stuff he has done. Maybe he wrote an outline and Village Roadshow Pictures was like, “Great we film tomorrow”! Usually I have something to say about the acting, but there is no point. This script just leaves actors to fend for themselves, so while I could be hard on them for being wooden or stilted, I am just going to give them all a pass. Especially Paul Giamatti whos job it is to hang around Caltech and say sciencey things. It is a shame they couldn’t get Ben Affleck to come rework the dialog in his Batsuit. All that being the case, the special effects are pretty cool, and for some reason it is always fun to LA and San Francisco tumble. It is a shame people had to keep talking and that this movie was almost two hours long. It would have been great as a forty-five minute Discovery Channel ‘what if’. If you are in the mood to laugh-off Johnson, Giamatti and co saying stupid stuff while the world falls apart, San Andreas might be what you are looking for, but I don’t think the producers envisioned the audience shaking with laughter when they made this movie. So if you aren’t in a so-bad-it’s-good sort of mood, watch something else. Previous PostPrevious Shmee Watched The Skies And Survived Neptune’s Fury! Next PostNext Shmee Needs Help Finding Dory!